Volsung is one of the eight high-ranked dragon priests in Skyrim. Volsung drops an eponymous mask, which makes prices better by 20%, increases carrying weight by 20 points, and gives waterbreathing. Volsung can be found in Volskygge in northwestern Skyrim. Note that you can just climb the mountain above the entrance and skip the dungeon entirely. Volsung's name might mean Air Horror or Horrific Air, as his name can be separated into two separate words: Vol, which means Horror, and Su, which means Air, in the Dragon Language. 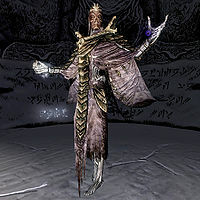 Volsung is extremely skilled in Destruction, Conjuration, Alteration and Restoration, with a level of 100 in each of the aforementioned skills. This page was last modified on 31 January 2017, at 12:47.